BCRC is a growing, resource-based organization that strengthens community capacity by providing professional support to organizations and individuals in need. The Centre is committed to helping visible minority youth rekindle their dreams, and achieve their full potential. 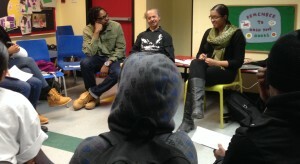 BCRC designs unique projects to address much needed concerns within the Black community. With the support of many partners, our projects are implemented in schools and in community centers throughout the city. Stay updated on the the status, needs and priorities of the English-speaking Black Community, thorough our monthly Semaji publication and our weekly News Updates. The BCRC has a wide range of volunteering opportunities for everyone, from policy research to communications to event set-up. Connect with us today to find out more.